Goldbeard Pirate Video Slot Guide & Review - Casino Answers! Goldbeard is a 5-reel, 20-line video slot developed by RTG, featuring wild substitutes, scatter wins, free spins with multipliers and a progressive jackpot. You can play the Goldbeard video slot at US-friendly casinos Cherry Red Casino and Rushmore Casino. Unless you want to start playing Goldbeard with the default bet settings, the first thing you are going to want to do is set your bet per line before you start spinning Goldbeard’s reels. Bet options are $0.01, $0.02, $0.03, $0.04, $0.05, $0.06, $0.07, $0.08, $0.09, $0.10, $0.25, $0.50, $1, $2.50 and $5 per line. Once you have set your bet per line, you can also change the number of active paylines, although we advise you leave it at 20 paylines. If you wish to speed up gameplay, the Goldbeard slot machine has a “Turbo Play” mode under “Player Options.” Whenever you’re ready to start playing, use the “Spin” button to spin the reels. 5 Pirate Ship symbols on an active payline will win you the Goldbeard slot’s 2500X top fixed jackpot. This can be doubled to 5000X if a Goldbeard symbol is apart of the winning combination. Other significant jackpot symbols are the Parrot, Cannon and Chest symbols. These symbols are worth up to 1000X on their own, but can also be doubled to 2000X. Even better than the fixed jackpots on Goldbeard is the progressive jackpot! Goldbeard’s Random Jackpot can be won on any spin you make, but make sure to increase your bet to increase your odds of winning. The progressive jackpot is triggered at random. Progressive jackpot wins will be added to payline and scatter symbol wins. Random Jackpot contribution is no more than 1.5% of total Return to Player. At the time of the writing of this slot machine review, the Goldbeard Random Jackpot was over $18,300! During the regular slot game, Goldbeard symbols only appear on the first and fifth reels. Goldbeard symbols will substitute for all other symbols except for scatter symbols. Goldbeard symbols can double your winnings when it completes a winning combination. When one or more Goldbeard symbols appear on both the first and fifth reel, each will reveal 2, 3 or 4 free games with a 3X multiplier. Goldbeard symbols can appear on the third reel during free games. 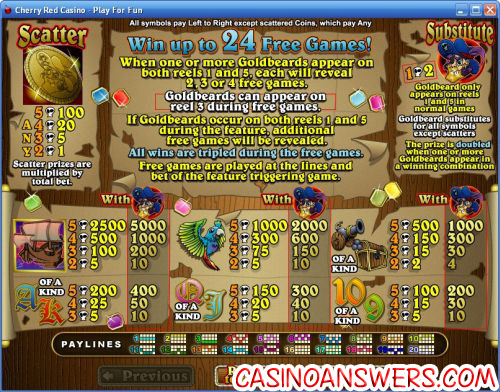 If Goldbeard symbols occur on reels 1 and 5 during the free spins feature, additional free games will be added. All wins are tripled during free games. Free games are played at the lines and bet of the feature triggering game. Goldbeard’s autoplay feature allows for players to play 5, 10, 25, 50, 100, 250, 500 or 1000 autoplay spins. You can set the feature to stop when the jackpot is won, if a win exceeds or equals your specified amount, to stop on any win, to stop if your balance increases or decreases enough or too much and to stop if the feature is triggered. You can stop the autoplay feature at any time. The Goldbeard video slot offers a skill stop feature. Using skill stop, you can stop the reels from spinning at any time during a spin. The “Stop” button replaces the “Spin” button while a spin is in progress. The skill stop feature is not available during autoplay. An excellent Realtime Gaming casino to play slots at is Cherry Red Casino. Cherry Red Casino offers a 100% up to $7,777 signup bonus created with the slots player in mind! To play Goldbeard and all of the other great RTG Real-Series Video Slots, please sign up and make your deposit today at Cherry Red Casino! Do I need to download any software to play Goldbeard? No, Mac users and players who don’t wish to download casino software can play the instant play Flash casino version of Goldbeard at Cherry Red Casino. If you encounter any problems with the Goldbeard Flash slot game, make sure you have the latest version of Adobe Flash Player installed on your computer. Are USA casino players able to play the Goldbeard progressive slot? Yes, most RTG online casinos such as Cherry Red Casino and Rushmore Casino are accepting signups and deposits from casino players located in the United States. How do I win the progressive jackpot on the Goldbeard video slot? To win Goldbeard’s Random Jackpot, all you have to do is play and have luck on your side. The progressive jackpot is triggered randomly, so all you can do is hope for the best. To increase your chances of triggering the jackpot, try increasing your line bet for best results. What other pirate slot machines can I find at online casinos? For more on pirate slot machines, please read our Captain’s Treasure Pro Review and our Pirate Slots Review. Are there any pirate slot machines? Is there any pirate casino games? 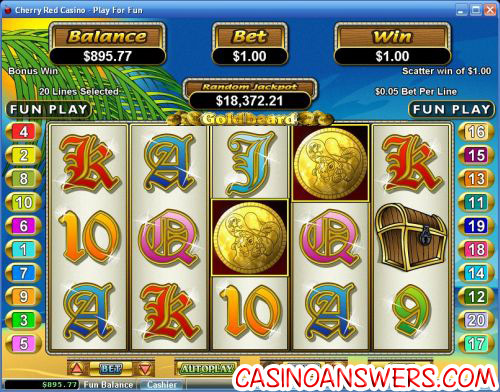 What is the best casino pirate game?